When an error in the XOXO matrix allows the dark force of Anti-Love to seep into our reality, an explosion rips a hole in spacetime and blasts the Ardor Reactor to pieces. The machine, that super smart scientists built to harness the force of love, was used to unite the whole galaxy in harmony. But, now broken, everyone has descended into mass hysteria. With Anti-Love now spreading across the galaxy, Dr Hopsy-Flopsy sends The Lovers (that’s the League Of Very Empathetic Rescue Spacenauts) on a mission to recover the machine’s scattered pieces, boarding the Gumball Zero to do so – a sturdy prototype battleship that contains the first portable Ardor Reactor. Now, that’s where you come in. The chance to explore a colourful galaxy becomes the least of your concerns when faced with the evil robots that Anti-Love has populated each sector with. Lovers in a Dangerous Spacetime is the kind of experience that either builds friendships or risks crushing them, developer Asteroid Base’s frantic couch co-op action space shooter soon seeing every player manically dash around the ship to man stations in reaction to whatever’s happening. The Gumball Zero has four Turret stations that can be used to obliterate enemies when they unwittingly drift into their fixed firing angle, an Engine station that is used to position and fire the thrusters to propel you in any given direction, a Shield station that will let you protect part of the ship, a Map station that, once data is recovered, will help you locate space-animals to rescue, and the Yamato Cannon station – a powerful weapon that automatically rotates around the ship meaning that you have to time when to activate it. Phew. Once players have chosen their space-friend to play as, everyone clambers into the ship to set out on their mission. Free to choose whichever station they want to take responsibility for, it won’t come as a particular surprise that success will require teamwork – where communication, cooperation, and coordination are paramount. With each station needing near enough constant attention, that means that no player is left to stand idle and the ship’s fate is in everyone’s hands. There are four campaigns that will see you explore the Ursa Major, Cetus, Orion, and King Cephus sectors, each containing four levels and a boss encounter in which pieces of the Ardor Reactor spew gigabuckets of Anti-Love into a nearby constellation to see it come alive. Your standard missions will see you exploring your surroundings in your neon ship to rescue cosmic space-bunnies – and, later, space-frogs, space-foxes, and space-ducks – that not only unlock seals to open up new paths, but will let you use the escape portal once enough have been gathered. That’s easy enough early on as your crew learn how to work together to operate the ship, but, as you move to other sectors, the developer soon throws other ideas to always keep you second-guessing. The first curveball in Ursa Major is the Wormhole Outpost where Dr Hopsy-Flopsy spots his old Wormhole engine prototype. Used to warp you to the next area, the floppy-eared professor warns that the engine is particularly fragile – seeing you protecting it from harm mid-warp as waves of Anti-Love robots attack. Then, Cetus throws in water-based planetoids with underwater currents, Orion requires that you use solar flares to take out enemies encased in ice, and King Cephus plays around with gravity. This constant reinvention means that, between moments where you yell at one another to man stations, your interest never wanes in Lovers in a Dangerous Spacetime. And, it results in the best kind of chaos. For that reason, it’s certainly a game that is best played with up to four friends. But, Asteroid Base hasn’t chosen to ignore those that may want to expel Anti-Love from the galaxy alone. Those that want to captain the Gumball Zero solo will be joined by a space-pet, whether that be Doppler the dog, Kepler the cat, Pythagoras the pig, or Riemann the raccoon. These loyal companions can be quickly ordered to man any station, and, while they aren’t always the sharpest tool in your neon ship, they can help to carry you through most of the game. The boss encounters, while meticulously and expertly designed, is one area where Lovers in a Dangerous Spacetime splutters slightly. I can imagine that these are meant to make players feel particularly overwhelmed, but the ship feels far too cumbersome to manage in order to counter their powerful attacks – at least unless you have four players. That challenge can still be overcome, but these were moments that frustrated. Gems can be used to power-up any station, collected in presents that pop out from floating crates. There are three types – Power Gem, Beam Gem, and Metal Gem – that will have a different effect on whatever they are slotted into, whether that be making your shield repel projectiles or turning a turret into a metallic wrecking ball. Then, the more space-animals that you rescue, the quicker your rank will increase. This will reward players with the chance to upgrade any station so that it can hold two gems at a time, opening up an opportunity to enable potent powerup combinations. On a Turret Station, for example, a Power Gem and a Metal Gem will unleash heavy missiles, whereas you can let loose with a rapid-fire laser with a Power Gem and Beam Gem combination. Sussing out what works best is part of the fun, and the Remover tool will help you to experiment without worrying about wasting any gems. As you reach higher ranks, you can unlock advanced ships to commandeer that not only have bonuses but can also present their own mischievous gameplay twist. The Banana Split has 20 percent more health, but due to a strict ID card policy players cannot access each other’s rooms, whereas a jelly coating means that the Jelly Roll won’t take terrain damage but has an engine that sees the ship roll 360 degrees. 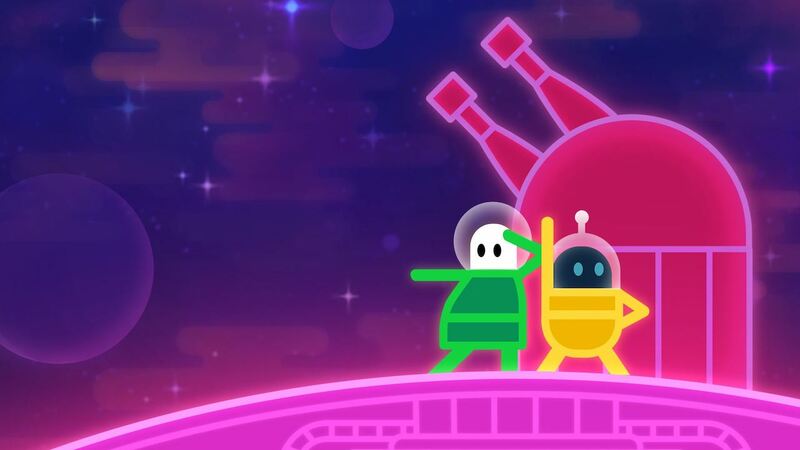 It’s this constant and playful mirth that embodies Lovers in a Dangerous Spacetime that makes the game such a riot to be a part of, and, now rallying Lovers on Nintendo Switch, there is no better time than to spread happiness across the galaxy. There’s an easy chance that you may just fall in love.